Cello's new TVs have integrated soundbars | What Hi-Fi? In German, if you need to make a new word, you can simply combine two (or three, or four) existing words together. It's this linguistic dexterity that means words like "Rindfleischetikettierungsüberwachungsaufgabenübertragungsgesetz" (literally, the "beef-labelling supervision duties delegation law") exist. Philosophically speaking, this is the approach British TV manufacturer Cello Electronics has taken towards its new line of Platinum LED televisions. TVs are known for having lacklustre sound quality, which is why we usually recommend pairing them with a good soundbar. Cello's solution? Integrate a soundbar into the TV stand itself. There are five televisions in this range, from 32in to 65in - everything over 50in has 4K Ultra HD resolution. On the bottom of each telly is the soundbar, which has four drivers (inside the 32in model) and six drivers (in all the others). 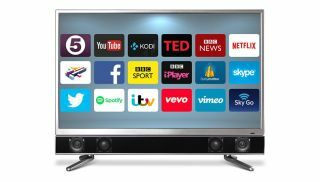 The televisions run an Android Smart operating system - which looks like a simple Android tablet scaled up to the size of a television - meaning you get all of Google's services alongside streaming apps like Netflix and BBC iPlayer. They'll be coming next month, with prices starting at £300 for the 32in model. The rest of the range costs £450 (for the 43in), £600 (50in), £680 (55in) and £980 (for the 65in model).